I got to meet Seth Green, and he bit me, which was AWESOME! Pancho and I got to meet Peter’s wife, Jennie. Pancho was really happy with where he got to stand in this photo. 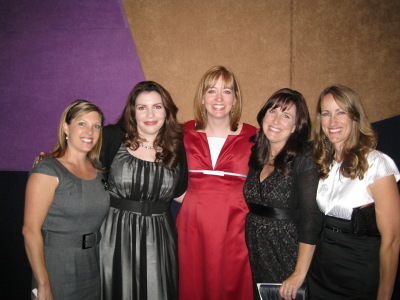 And finally this is one from the little Arizona premiere that we did with friends and family. Can you spot a Newbery-Award-nomination-earning-author in this picture? Los Angeles, CA, December 7, 2008 — Summit Entertainment and director Catherine Hardwicke jointly announced today that the filmmaker will not be directing the next installment in the newly minted TWILIGHT film franchise. 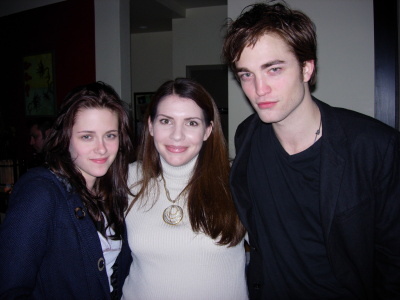 Summit’s targeted end of 2009 or early 2010 release of the film, NEW MOON, does not work with Ms. Hardwicke’s required prep time to bring her vision of the film to the big screen. Thus as has been done before with many successful film franchises, the studio will employ a new director for NEW MOON. Los Angeles, CA November 22, 2008 — Summit Entertainment announced today that the studio is officially moving forward with the production of NEW MOON, the second installment of its filmed franchise TWILIGHT, the action-packed, modern day vampire love story. 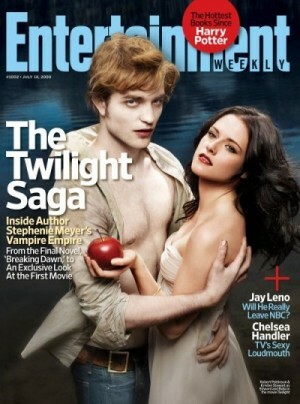 The movie will be based on the second novel in author Stephenie Meyer’s Twilight series titled, New Moon. The first movie in the TWILIGHT franchise, the self-titled TWILIGHT, arrived in theaters this weekend to sold-out showings. Starring Robert Pattinson and Kristen Stewart, TWILIGHT tells the story of 17-year-old Bella Swan who moves to the small town of Forks, Washington to live with her father, and becomes drawn to Edward Cullen, a pale, mysterious classmate who seems determined to push her away. But neither can deny the attraction that pulls them together…even when Edward confides that he and his family are vampires. Their unorthodox romance puts her in physical danger when Edward’s nemesis comes to town and sets his sights on Bella. 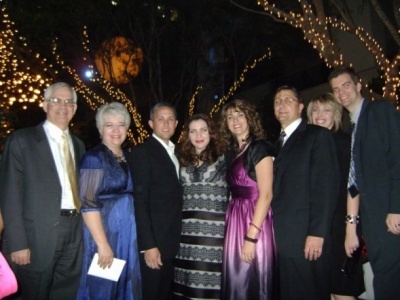 As mentioned on the home page, I (Seth) had the incredible opportunity of attending the premiere of Twilight the movie in Los Angeles. Thank you to Stephenie for inviting me — it truly was a once-in-a-lifetime experience. The after-party and movie were both fantastic. But, I wasn’t on the red carpet (when I tried to sneak on, security mentioned something about me “not being good looking enough”). If you haven’t seen pictures from the red carpet, you can see them at mtv.com, imdb.com, and about a thousand other places, and you can read a good description of the night from Larry Carroll at MTV. Although I am not a movie critic, I feel compelled to tell everyone what I thought about the movie. The first question everyone seems to ask is “was it as good as the book?” The answer is “no”. But, I can’t think of one good book which had a movie made from it that was as good as the book. I think that it would be impossible to reproduce the type of experience that it is to read Twilight in two hours. Will fans of the book enjoy the movie? Absolutely. Will so-called “Twi-Hards” scream, laugh, squeal, giggle, and swoon (not necessarily in that order)? Definitely—and the chosen order will probably be repeated several times. Maybe a better question (especially for those of you who might be afraid to bring your boyfriend/husband) is if people who haven’t read the book will like the movie? I say “yes”. It is not uncommon for someone to feel like they don’t have the time or the attention span to read a 500 page book. But, the core story of Twilight has been brilliantly preserved in the two-hour time period, and there is no reason to think that just because someone isn’t an avid reader they won’t enjoy a great story. Also, just like in the Stephenie’s book, there is a good amount of both action and comic relief (enough even to entertain those who are “too manly” for a love story). In case you can’t tell, I really liked the movie a lot. It wasn’t perfect, but it was extremely good. There are several more things that I want to tell everyone (especially about the amazing talents of several of the actors), but I don’t want to give anything away. I want you to be as pleasantly surprised as I was. I did want to quickly say how impressed I was with the actors off-screen. I was able to talk briefly to several of the actors and I was astonished at how down-to-earth and nice they were. For example (and I feel bad mentioning only a few because they were all great and really seemed to enjoy talking to fans) Peter Facinelli (Carlisle), Rachelle Lefevre (Victoria), Ashley Greene (Alice), and Taylor Lautner (Jacob) are some of the nicest people you can imagine. I just think it is so awesome when good people find success. I know that a lot of time and hard work went into making this movie, and in my opinion it really paid off. I hope everyone enjoys the movie as much as I did. I’ll be excited to read your reviews and comments on fansite forums and blogs. In Style Magazine has given us these exclusive images from their recent photo shoot with the cast from the movie. You can see more photos in the December issue and outtakes here. For those of you who have emailed me about the Twilight Talent Tour (see October 31st post), I am very sorry. I promised to post more information, and I forgot because the information was never forwarded to me. If you are interested, click here for the complete list of locations and rules. And that is not the only thing that I feel guilty about. Over the weekend I read several movie blogs that discussed the pre-sales of movie tickets. All of the articles that I read mentioned that a lot of showings from the opening weekend are already sold out. Sites like Fandango and MovieTickets.com have been selling tickets for a couple of weeks and we have not made any mention of it on our site. Consider yourself warned! And finally, in case you haven’t heard it from anyone else, there will be an exclusive clip from the movie shown during Heroes tonight on NBC. Although I haven’t heard anything about the clip, I would suggest tuning in because I think Heroes is a pretty good show. Entertainment Weekly has given us permission to exclusively reveal of one of three Twilight covers hitting newsstands this weekend. Click here to see Rob Pattinson’s solo cover and read the article. EW.com will reveal Kristen Stewart’s cover tomorrow. The following information was just forwarded to me by the good people at Summit Entertainment (the movie production company). Although there is obviously some missing information, it will be posted in the next few days. And I didn’t think anybody would want to wait any longer for this information. Enjoy! TWILIGHT Cast members are coming to city near you! Once again, the details will be added soon. No need to email anybody or search high and low for more information… we will post it very soon. I hope you have a Happy Halloween! It has recently been announced that the CD booklet inside the physical CD will fold out into Twilight posters! There are 4 different posters and they are randomly mixed throughout the stores, so good luck on getting your favorite! Also, the album is now available to pre-order on iTunes—the iTunes version has 3 bonus songs including Rob Pattinson’s ‘Let Me Sign’, plus 2 orchestral pieces from the movie, La Traviata and Clair de Lune. Click here to pre-order from iTunes now! First, we get to exclusively unveil Perry Farrell’s song, “Go All The Way (into the Twilight)” for your listening enjoyment. As you know, this song will be part of the official Twilight soundtrack (in-stores November 4th). [Click on the play button on the audio player below to listen]. The Perry Farrell song has been removed from our site; we have been unable to host more than one streaming song at the same time. That may change in the future. In other awesome soundtrack news, we have just learned that the music video for Paramore’s “Decode” will be premiering on November 3rd! You can watch it all day on MTV, MTV2, MTVu, and MTV.com. Make sure to check MTV.com leading up to the premiere to see exclusive snippets and a behind-the-scenes look at the making of the video. Take a look at these exclusive stills from the video below! If you haven’t already done so, click here to pre-order the official Twilight the movie soundtrack! And if you don’t want to wait another twelve days for the soundtrack — don’t forget about the soundtrack listening parties this Friday in Hot Topic stores. The final trailer for Twilight the movie is now available to view. You can watch the HD version at theMySpace.com Trailer Park or the regular version in the widget at the top of this page. Also, we added another new movie poster below. Enjoy the trailer, and have a great weekend. “We are excited that we’ve been given the exclusive track list announcement for the Twilight soundtrack (in stores November 4th). We can also confirm that every song listed below will also be featured IN the Twilight movie. 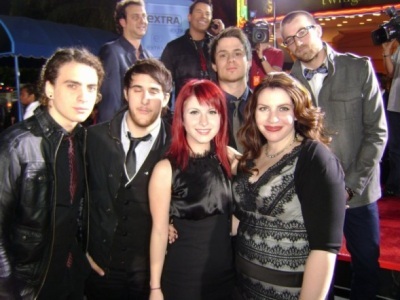 The soundtrack has exclusive songs written specifically for the movie from Paramore and Perry Farrell. The Twilight soundtrack also features a song from Robert Pattinson—this is the first time Rob has recorded or released music. And, of course, no Twilight project would be complete without Muse. Summit has let us know that there will be a new, final trailer for TWILIGHT coming soon! It will be debuting in theatres on Friday, October 10th in front of certain movies (it is at the discretion of the individual theatres). There will also be a sneak peak of the new trailer on Entertainment Tonight on Thursday, October 9th. Immediately following the sneak peak, Summit is letting the fans be the first to see the trailer online in its entirety and share it. You can see the trailer first online before it’s officially released, via the Twilight widget. If you don’t have the widget, you can grab it from the official film site at TwilightTheMovie.com. The trailer will be available exclusively via the widget starting at 8:00 PM PST on October 9th for one hour, before launching in HD on MySpace at 9:00 PM PST. A countdown clock will be added to the widget shortly, counting down to this highly anticipated event. Stay tuned for more exciting movie news! Although the names of the other songs/artists which will be included on the soundtrack will not be released for a few more days, it is already available for pre-order. Click here to pre-order the official Twilight the movie soundtrack! Stay tuned for more soundtrack news. So, many of you have heard that the release of the sixth Harry Potter movie, Harry Potter and the Half-Blood Prince, has been moved from this Thanksgiving to next summer. First and foremost, please know that this schedule change has absolutely nothing to do with Twilight, me, or Summit Films (so enough with the imdb death wishes, okay?). This is Warner Bros. decision, and it was not motivated by anything Twilight-related. Now for the good news! Though we’re all sad to have to wait for Harry Potter, this open spot at the theater creates a cool opportunity. The good people at Summit were thrilled to let me know that now Twilight fans are going to get their movie three weeks earlier than scheduled. That’s right—Twilight will be released in theaters November 21st! Let the merry-making commence! 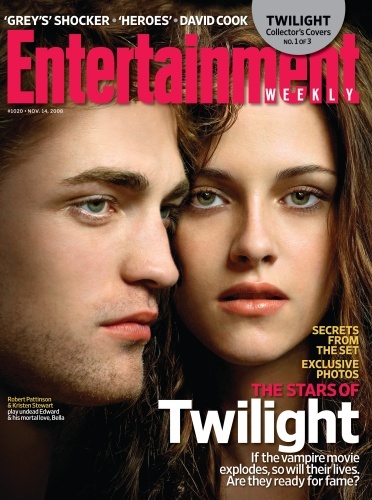 Many of you have asked me about obtaining copies of the recent issue of Entertainment Weekly which included articles about Stephenie and Twilight the movie. Due to the high demand, EW has decided to print more and is offering them for purchase here. Summit Entertainment has released another teaser trailer for Twilight the movie. Click here to view the trailer at Yahoo Movies. Here is a link to the new behind-the-scenes footage that Summit has released (which was recently played on Entertainment Tonight). Also, don’t forget to check out the new Twilight stories on the MTV Movies Blog — there are some good ones (including the footage mentioned above) (also, if you ever forget the web address of the blog, there is always the image link on the top of the page). MTV.com is showing the first completed scene of Twilight the movie. Click here to watch it on their site (international fans: if you can’t watch the video in your country, click on the blue ‘Watch this in HD’ button to view the clip; update: here is a special link for my special friends in the UK). As many of you have already seen, Summit Entertainment has released a trailer for Twilight the movie. Click here to view the trailer on myspacetv.com. Also, a movie poster has been released: click here to view it along with an article about the photographer on mtv.com. Here is a really interesting article about Twilight the movie, IMDb stats, and everybody reading this (as Stephenie says, “the best fans in the world!”): ‘What is Twilight?’ on Slashfilm.com. In my opinion, this is the best video clip yet: Twilight on MTV.com. Enjoy! This is me with the humans—who don’t get enough love—and director Catherine Hardwicke in the “Forks” high school cafeteria. I got to watch the filming of several key lunch scenes, and see how amazingly well the actors were portraying those human characters. Watching them be Mike and Eric and Jessica and Angela and Tyler made it feel strangely like it all might just be real—which was a crazy feeling. So the humans get two thumbs up from me. And Greg (Tyler) wants us all to know that Bella would definitely choose a guy with an awesome van over some vampire. PETER: So vampires would never eat food, unless they are trying to fool humans? They would never eat at home? ME: Why do you ask? PETER: Well…when we were filming one of the scenes in the Cullen house, Esme brought me a bowl of Raisin Bran. I was eating it through the whole scene. I don’t think they could cut around it, because I was chewing through some of my lines… I guess that wouldn’t make a ton of sense for Carlisle to do, though, would it? ME: (slightly panicky) Er, no. It really wouldn’t. PETER: And also, April Fool’s. 1) While watching the playback from a very intense scene with Bella and Edward, the girl next to me literally slid right out of her chair—I think her bones melted. She also may have stopped breathing for a few seconds, too. I know I did. 2) Mike Welch can dance. 4) Portland is too cold. For anyone. But especially for Arizonans. 5) Jackson Rathbone can really play the guitar. Our taste in music is not exactly the same, but we found common ground with Radiohead’s Creep, with which he then serenaded me. 6) As you might guess, I do a lot of internal swooning on the set. However, I have an excellent poker face. To conclude, I would like to make a few comments about Rob and Kristen, who are the true heart of this movie. First, they are both amazing actors. Second, they are channeling Edward and Bella like nobody’s business. Third, you might want to bring a paper bag to the movie, because their on-screen chemistry may cause hyperventilation. That is all. Here is a link to the recent MTV News video about Twilight the movie: MTV News on mtv.com. We have finally been given permission by Summit to post the full cast list. I have added links to each actor’s IMDB.com page — just click on their names. I don’t have any more information than what is on the list above. When I am forwarded more news regarding the movie, I will post it as soon as possible. Enjoy! 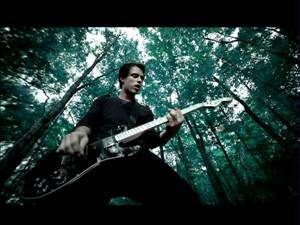 This is a great video clip: ETonline.com’s Behind the Scenes of ‘Twilight’. One of the coolest things about being a writer—for me anyway—is that I get access to advanced copies of books I’m excited about. I always feel a little bit like I’m cheating—but I love it. Imagine my excitement to find out that having my book made into a movie means that I get the same perk for movies! Long story short, Summit was nice enough to let me get a sneak peak at Never Back Down, which hits theaters tomorrow (3-14-08). One of the funnest things about this very fun film was getting to see Cam Gigandet, who stars as the villian, being all James-y. Most of you know that Cam will be playing James in the Twilight movie, and now I can vouch for the fact that he will be awwwwwwwwesome. Plus, I just really love a good fight sequence. And eye candy. And the bands TV on the Radio, The Bravery, and My Chemical Romance, who are all part of the viewing experience. Did I mention the eye candy? 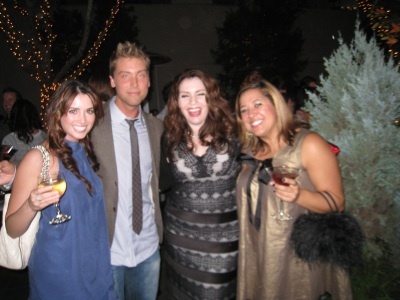 Rachelle Lefevre, the actress who will play Victoria in Twilight the movie, recently was interviewed by MTV Movie News. Click here to read the article on mtv.com. Stephenie has asked me to post this link for everyone because she read the article (while on tour in Germany) and loved it. Hey guys, I thought you might enjoy a couple of pictures from my weekend on the set of Twilight the movie. It was an amazing time; I had the chance to visit some of the film sites (Oregon is gorgeous! ), go through the story boards (if just scanning through the sketches is so exciting, I can only imagine how much more thrilling the live action will be), watch some brief videos of stunt work (ouch! but so cool), and even catch a little bit of a vampire baseball game (look out—James is a ringer). My favorite part was dinner with some of the cast and crew. You don’t know surreal until you sit down at a table with people out of your imagination. It was more than a little bit disturbing how pretty everyone was, and who knew movie stars were so nice? Anyway, if you ever get a chance to visit the set of a movie based on a book you wrote, I definitely recommend that you go for it. 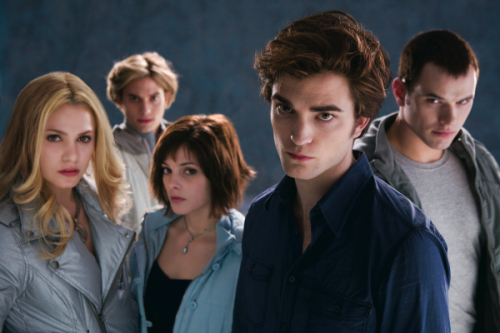 Los Angeles, CA February 19, 2008 — Summit Entertainment announced today that it has rounded out the cast of the Cullen family in the first installment of its filmed franchise, TWILIGHT. 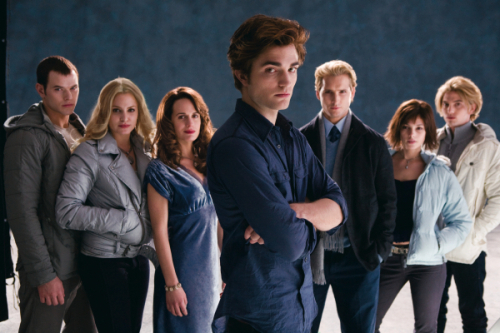 The family of vampires, to which the leading male character Edward Cullen belongs, will be comprised of actors Peter Facinelli as Carlisle, Elizabeth Reaser as Esme, Jackson Rathbone as Jasper, Nikki Reed as Rosalie, Ashley Greene as Alice and Kellan Lutz as Emmett. 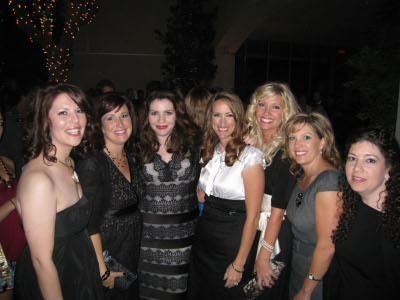 “Finding six talented actors who can portray supernaturally beautiful, talented vampires of the sort Stephenie Meyer has created and her fans have come to know and love was not an easy task but we are happy to say we have found our perfect Cullen family,” said Erik Feig, Summit’s President of Production. The credits for the actors comprising the Cullen family include popular film and television titles. Peter Facinelli (THE SCORPION KING, RIDING IN CARS WITH BOYS) just completed work on the critically acclaimed first season of Damages. Reaser had roles in the comedy THE FAMILY STONE and has been seen on the hit TV series Grey’s Anatomy. Rathbone was seen in PRAY FOR MORNING and also appeared in the TV series The O.C. Reed also played a role on The O.C. and also has been seen in LORDS OF DOGTOWN. Greene has been seen in both Shark and Crossing Jordan. Lutz appeared in ACCEPTED and the HBO series The Comeback. 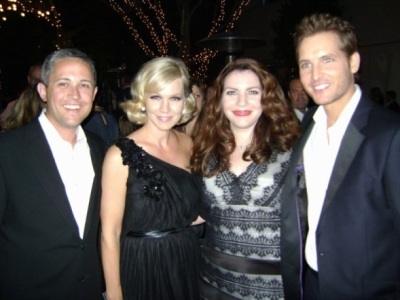 Facinelli is represented by Paradigm and James/Levy Management. Rathbone and Reed are also represented by Paradigm. Reaser is represented by UTA. 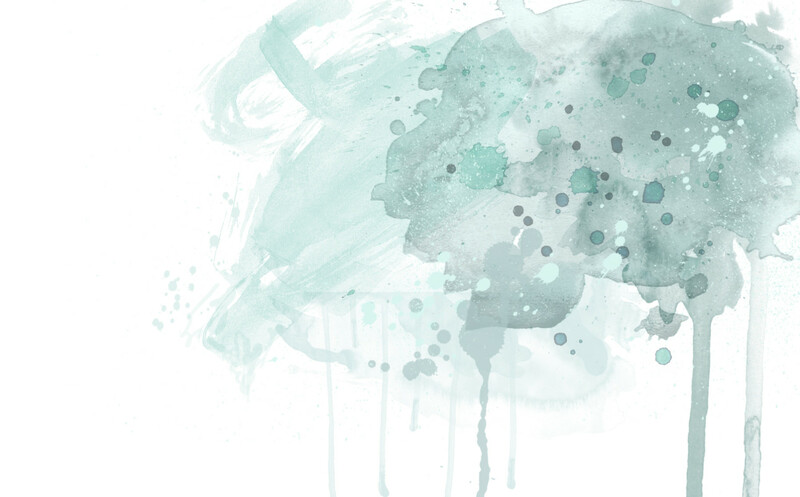 Greene and Lutz are represented by Innovative Artists. Here is a link to an interview that Kristen Stewart did on MTV’s Movies Blog. Enjoy! Twilight the movie was recently switched from the “Pre-Production” section to the “In-Production” section on Summit Entertainment’s website. PORTLAND, ORE. Lana Veenker Casting announced today that it is seeking a 16-18 year old Native American male to play a significant role in the upcoming Summit Entertainment film “Twilight,” directed by Catherine Hardwicke. 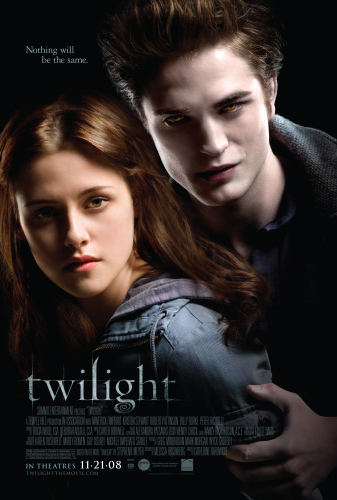 The film is based on the publishing phenomenon “Twilight,” written by Stephenie Meyer, and is highly anticipated due to its popularity among young adults. An open casting call will take place in Portland on Saturday, January 19, 2008, from 9:00 am to 1:00 pm at Lana Veenker Casting, 2580 NW Upshur Street, Portland, Oregon 97212. Applicants who fit the age and ethnicity requirements for the role will have their photos taken and may be asked to read lines in front of the director. Applicants who are unable to attend Saturdays open call should email their contact information and a photo to talent@slateplease.com. More information is available on the casting company website at slateplease.com or on its MySpace page at myspace.com/ lanaveenkercasting.